Beautiful Heart-Shaped Buttons with “Love” – Make cute craft projects with this lovely and colorful selection of Heart Buttons. They are great for sewing, knitting, crocheting, scrapbooking and all your other craft projects. The heart buttons come in different colors and styles. 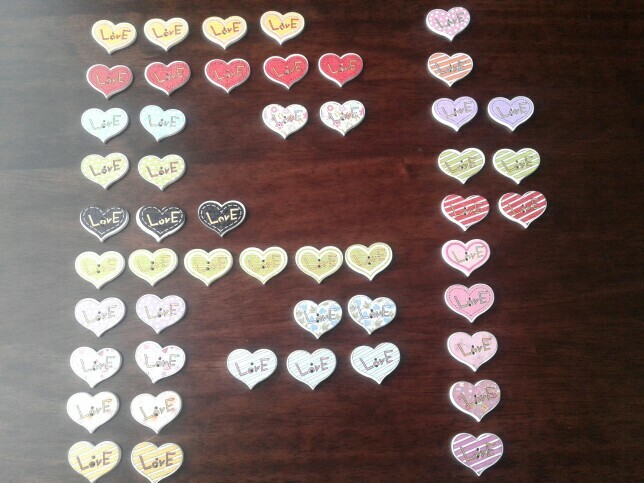 You will receive a random color mix of 50 wooden 2-hole heart-shaped buttons with the text “Love”. Good size, beautiful many thanks. Greetings from southern Chile.